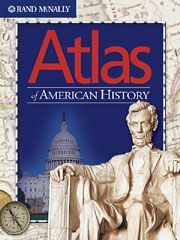 This paperback atlas is a collection of colorful graphic maps depicting many topics in American history. The eight chapters feature the changes in time from early history and Colonial times on through to today. An interesting chart shows the years that each president served in office and a significant geographic event that occurred during each term. Another noteworthy chart shows the population of each state from the year 1650 to the year 2000.